I don’t know about you all, but I need a shot of orange to brighten these cold, colorless winter days. It’s also too cold to shoot anything outdoors, so I’m offering up an image from October when things were warmer. This is the Spanish Ballroom at Glen Echo Park in Maryland. You can see more photos of the park here. I love this 1930’s Mediterranean-style Art Deco building. It was decorated for a party later that day, hence the Chinese lanterns. There’s just something so cheering about the color orange. 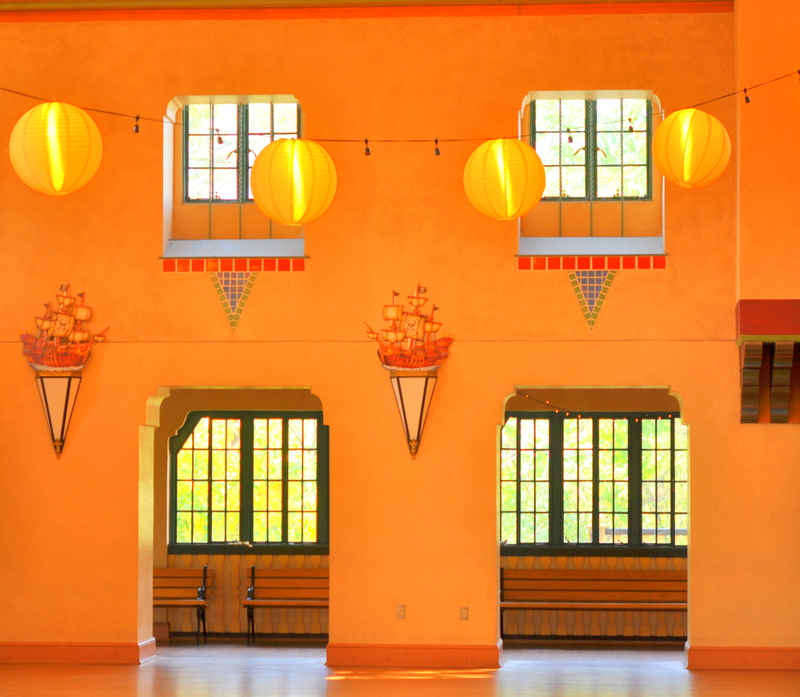 This entry was posted in photography and tagged Art Deco, benches, Chinese lanterns, Glen Echo Park, Mediterranean style, orange, Spanish Ballroom, windows. Bookmark the permalink. You’re right, a bit of orange these days is so soothing to the eye! 🙂 Here it’s dark already at 4:30 and grey as can be. Cool. It’s getting dark early here too. We had our first snow today…. Wonderful color. Amazing how just looking at a color like this sort of warms you up. I’m typing with fingerless gloves these days, something I never imagined doing! Our study is the coldest room in the house, so I may have to move my laptop if the temp doesn’t rise soon. Wow! When I first saw this pic, I didn’t realize it was real. I thought it was a painting. Hey, thanks! I’d love to learn how to paint this one day. Love the orange especially with the early dark cold days in Minnesota. We have a couple of local Mexican restaurants that had done a beautiful job with the interior design, wonderful colors. I never thought of taking my camera there but it would be fun for sure. Minnesota! I have relatives there, so I know what you’re going through. I’d love to see some shots from that restaurant. The colors of Mexico are so vibrant…I want to go back and take more pictures this time. That is so beautiful, the color is obviously amazing but the structure itself is beautiful as well! Wonderful capture! I really love the architecture of this place. Thanks so much for all the nice comments. I really appreciate that.